This chic foyer designed by Kelley Proxmire for The Washington Design Center’s 2010 Design House is incredible! Kelley was inspired by a pair of turquoise vases she discovered at the closing sale of Charlotte Moss’s shop in NYC. For her “Glitz and Glamour Galore” Foyer, Kelley envisioned the space as the Park Avenue home of a New York socialite, and a backdrop for big entertaining. How cool is that David Hicks-inspired octagonal pattern painted on the bamboo floor?? Read more about this fabulous room here! 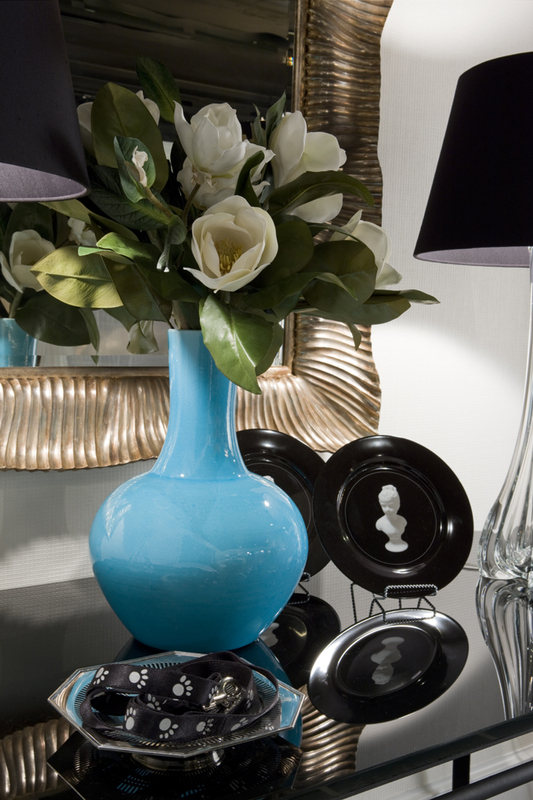 Black and White…with Turquoise of course! Your images are always so amazing. Your blog is the first one I can't wait to check out in the morning. This room is stunning! 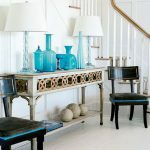 You don't really think of turqoise as a formal color (more casual), but paired with black and gold, it is truly special. I also love the hexagonal pattern on the wood floor. This is incredible! It's very refined in the color scheme, but for some reason it doesn't seem to monochromatic. I am so in love with that honey comb floor. What a cool idea!! Stunning. I love that painting (turquoise abstract) too. Sooooo pretty. What absolute drama! I love it! The zebra print stool is so fun! The honey comb floor looks particularly chic! Omigosh..it looks like an amazing ballroom..so so glamorous! What a gorgeous foyer! I absolutely love it. Especially the last photo with the turquoise artwork above the buffet/dresser. I would love to have that artwork for my family room. The abstract with the coordinating lamp shade is to die for!! WOW!!! absolutely gorgeous….love everything about it. Phenomenal! I love the hexagon floor! 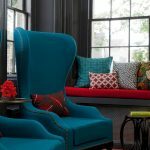 I know this is about turquoise, but there is just something about black! what a adorable room!!! I like it really much! A really good combination of clean style and glamour! Perfect for me! Oh my! What a gorgeous room! Several gorgeous rooms! Love these!! Have a great day!! devistatingly gorgeous….as usual my sweet. i love it. That is GORGEOUS – AMAZING…and oh, I want to live there!!!! love the turquoise, black and white together! I love that last image! gorgeous. such a load of color, drama and GLAM! great scheme with lots of excitement. This room is absolutely gorgeous! Where to begin? I love the doors, the art, and photos on the plate. What an inspiration.